Charlie´s Blog - Buenos Aires Travel Information: Cataratas del Iguazu: One of the "Seven Wonders"
This blog is about Buenos Aires Travel Information, but we can´t let pass a huge piece of news like this. 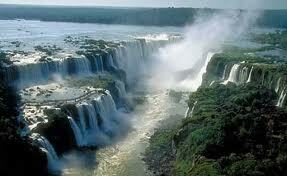 Iguazú Falls was recognized last November 11th. as one of the "Seven Wonders" by the fundation "New Seven Wonders". Iguazú Falls won among 400 places that participated in the contest. The other Wonders are: Amazon, Halong Bay, Jeju Island, Komodo, Puerto Princesa Underground River, Table Mountain. Misiones Mayor said "the tourism promotion is priceless" and he was very grateful with all the people that supported this argentinian participation such as Messi, Ginobili, Scola, among others.